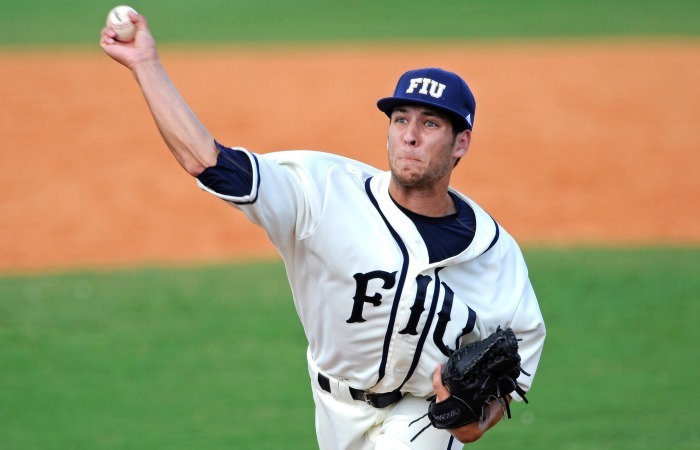 When FIU pitcher Mike Ellis woke up on Saturday, Feb. 15 – the day he was supposed to make his first start of the season – he immediately knew something was wrong. The first thing he felt was stiffness in his back, and it was the last thing he wanted to feel that morning. Here we go again, Ellis thought. He went on Netflix, searched for a yoga program and performed some stretches that helped him loosen his back. Regardless, the redshirt junior was not going to let some stiffness derail this day. It would be his first taste of game action in a year after he suffered a lower back stress fracture that sidelined him for the 2013 season. Ellis was slated to start the second game of a doubleheader against Rutgers at FIU Baseball Stadium. After strong outings from FIU starters Mike Franco and Robby Kalaf gave the Panthers wins in their first two games against the Scarlet Knights, there was a little more heat on Ellis. “I didn’t want to have the first bad start of the season so there was a little more pressure,” he said. As game time neared, he began to feel the tension grow. The first pitch has always brought out the most nervousness in him. He reared back and threw the first pitch, a fastball, which hit the outside corner for a strike. A good start. A good start was what Ellis was hoping for a year earlier. Heading into FIU’s final season as a member of the Sun Belt Conference, Ellis was named to the 2013 Preseason All-Sun Belt Baseball Team after finishing his sophomore season with a 3-2 record and a team-best 3.13 earned run average in 14 starts. After being named the Friday night starter for the Panthers, the bar was set high for the right-hander from British Columbia. During a weight lifting session in January, however, he tweaked his back and although doctors said he was suffering from muscle spasms, things took a turn for the worse during his third start of the season against Ole Miss. His back was causing so much pain that he was forced to throw sidearm to finish his outing. After a battery of tests, the doctors determined the injury was a stress fracture. At first, doctors told Ellis he could possibly be back on the mound in less than a month, but scan after scan in the months ahead showed that his back still needed time to heal. The season came to an end without Ellis throwing another pitch, and some troubling thoughts began to come to the surface after returning to Canada to take on a couple jobs for the summer, including one with a painting company. But painting wasn’t the only job that Ellis had that summer. He was also coaching with his former youth baseball club, the Langley Blaze, working with younger pitchers on their mechanics and delivery. According to Ellis, coaching helped him improve his curveball, his changeup and also added some speed to his fastball. He continued to rehab throughout the summer and fall months and even though he was cleared to play by the doctors, there was still a lingering hesitation on Ellis’ part on whether or not he would be strong enough to pitch. Those doubts were relieved in late January, just weeks before the season as training began for the new season. In a throwing session with relief pitcher Mike Gomez, Ellis said he threw the ball as hard as he had ever thrown and, more importantly, pain-free. The first pitch strike in his first start back proved to be a sign of good things to come for Ellis, who shut down the Scarlet Knights in five innings pitched, allowing no runs and striking out three. Most importantly, he helped FIU remain unbeaten with a 5-0 victory. “Your goal as a starting pitcher is to give your team a chance to win and that’s what I did,” Ellis said. Now Ellis is focused on giving his team a chance to win for the rest of the season, focusing on getting better each day and leaning toward what lies ahead. “I’ve dealt with a lot of adversity and for me it helped build mental toughness and that can translate to situations on the mound,” Ellis said. “If you throw a bad pitch, you can’t the last thing dictate what you are going to do next.